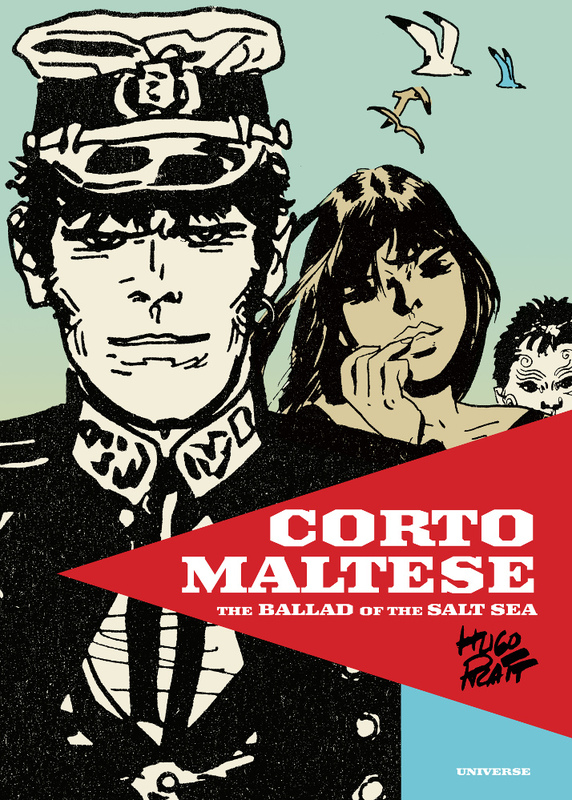 A work long out of print for the English market and mostly forgotten by North American comic readers, Corto Maltese: The Ballad Of The Salt Sea is now back in print. Treasure hunter, sailor, and adventurer, Corto Maltese remains one of the most popular characters from graphic literature in Europe and maintains a devoted cult following among American readers and creators. 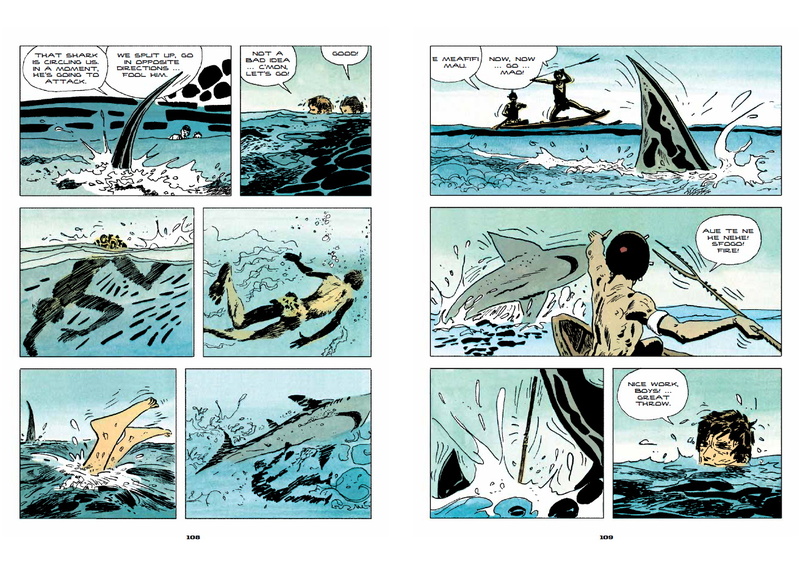 Originally published in 1967, Corto Maltese: The Ballad of the Salt Sea introduces our hero for the first time. The story begins with Corto Maltese adrift at sea in the Pacific during World War I. 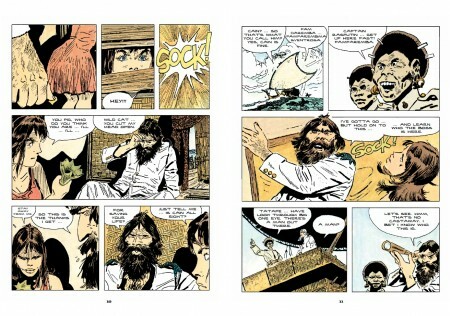 He is picked up by a Russian pirate/privateer named Rasputin. The graphic novel follows Corto and the adventure that ensues. 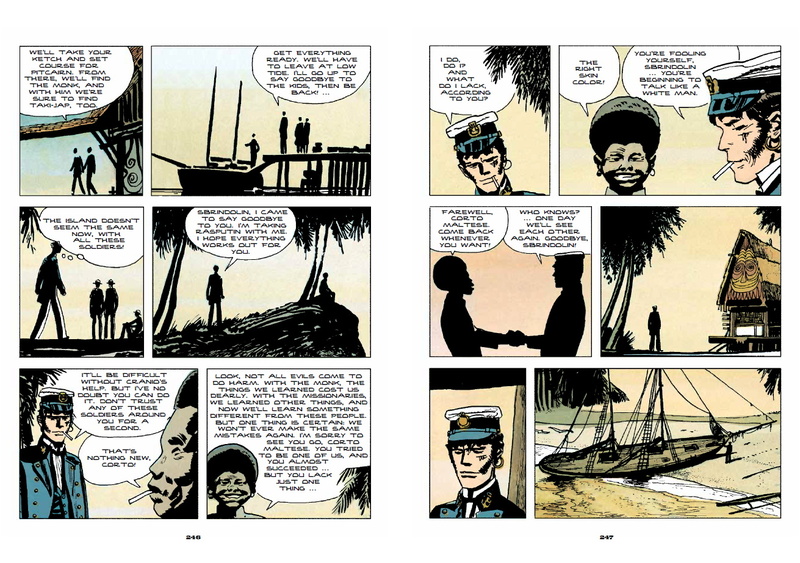 Hugo Pratt and his character Corto Maltese carry a lot of weight in European comic circles but North Americans have long been denied an English translation of his works. 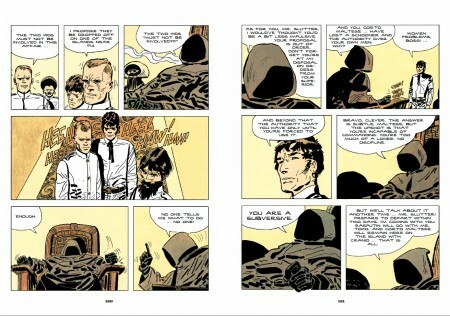 This book introduces us to Corto and provide a tale told in graphic format unlike any I’ve read. On the cusp of World War I we are introduced to a group of pirates in the South Pacific, aiding the German navy and generally behaving badly. They’re a colourful and dynamic group, full of larger than life personalities. They pick up two teens in a lifeboat and decide to hold them hostage. On that same trip they pick up Corto Maltese, having been put to sea by his mutinied crew. From there we’re brought to Escondida, the secret pirate island run by the mysterious pirate leader the Monk. The dynamics of the group teeter and with the unexpected twists of the hostages, pirates and German naval officers culminating in utter destruction. This is an involved and rich story told wonderfully in the graphic novel format that looks at the levels of villainy, where readers don’t side with right and wrong but have to choose the wrong that’s the most right. From the hostages to the pirates, locals and foreigners encountered everyone is trying to get what they want through whatever means are available. Yes some have a moral code but they’re still working towards an end. And that seems to be the appeal of our lead Corto Maltese; he’s a scoundrel that eventually gets around to doing the right thing. Pratt started this story serially in 1967 and it has a feel that doesn’t quite feel modern. Violence in this world is part and parcel but sexual violence seems suggested and is on the cusp repeatedly but never goes beyond that. It’s a period work and stays very much in the sensibilities of the early 20th century. The south Pacific locals (natives) are well portrayed, getting through the foreigners and working for their independence but it such a subtle and long-suffering manner. The harshest characters as portrayed are the major powers vying for control in their Imperialist overtones: Japan, Australia, Germany. There’s even a happy ending. The art style is unique and engrossing in its simplicity. Harsh lines, simple colours and heavy inks. It feels like Pratt put just enough detail into the panels to get across his story. Very effective. Corto Maltese: The Ballad Of The Salt Sea is presented in that oh so popular 6×9″ softcover format; it’s a handful and well worth the $25 price, even without any extras. I was provided a digital copy for review so I can’t comment on the book’s fit and finish. Pratt and Corto were such overwhelming influences on the medium every comics fan needs to give it a read.